Last January 6, 2009, Apple held its Macworld San Francisco keynote with Phil Schiller, Apple’s senior VP of Worldwide Product Marketing, taking the stage. During Apple’s last Macworld keynote, the company introduced new versions of their multimedia suite, iLife, and office suite, iWork. Apple also released the new 17-inch MacBook Pro, which completes the lineup of Apple’s portable into the unibody design. Last but not the least, Apple announced DRM-free songs at the iTunes store. This post will give a rundown on what’s new with the 17-inch MacBook Pro. Apple unveiled the new aluminium unibody design last October, giving the 13-inch MacBook and the 15-inch MacBook Pro a more durable enclosure. The unibody design not only made the portables sturdier but also made it more lighter, thinner and more resistant to flexing. On January 6, 2009, Apple introduced the unibody 17-inch MacBook Pro, thus completing the transition of the entire MacBook family to the new design. Apple also revealed that the 17-inch MacBook Pro has a built-in battery which last longer and has more charging cycles compared to conventional notebook batteries. Through advanced chemistry, intelligent monitoring of the system and battery, and what Apple calls Adaptive Charging technology, the new MacBook Pro has up to 8 hours of battery life and 1,000 charging cycles, lasting three times longer than the conventional. All this without adding to the thickness, weight or the cost of portable. Apple’s most powerful notebook has a thickness of 0.98 inches and weighs in at 6.6 pounds. Base unit costs $2,799 with options to upgrade to a faster processor, a bigger hard drive or to a solid state drive, more RAM, and an anti-glare screen ($50). 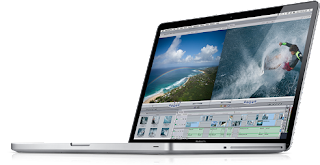 The new 17-inch MacBook Pro will be available at the end of January.